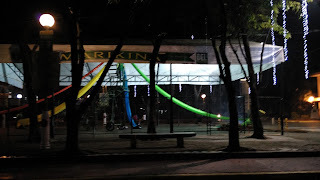 The Marikina Sapatos Festival officially starts on October 26, 2015 and will run until December 30, 2015 at Freedom Park in front of Marikina City Hall. The grand opening will be held at Plaza de los Alcaldez at 8am. This year marks the 10th Marikina Sapatos Festival. In 2005, a City Council ordinance renamed the Sapatero Festival to what it is known today as the Sapatos Festival, with its objective of revitalizing the city's shoe industry and give recognition to Marikina-made shoes. This year, the Sapatos Festival has also expanded to include Marikina-made bags. Aside from the Mega Shoes and Bags Bazaar at Freedom Park, which will be held every Monday to Thursday from 8am - 6pm, every Friday - Saturday from 8am - 10pm and every Sunday from 8am - 7pm, weekend fairs will also include activities such as Zumba (every Saturday at 7am), Banchetto and food fairs (every Fri & Sat. from 8am - 10pm), cooking demos (every Friday 6pm - 9pm), and movie nights/variety shows (every Saturday & Sunday from 9am - 10pm). An evolution of shoes exhibit is located at the Marikina City Hall quadrangle. 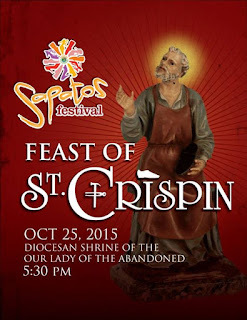 Our Lady of the Abandoned Church celebrated the Feast of St. Crispin on the eve of the 2015 Marikina Sapatos Festival. . 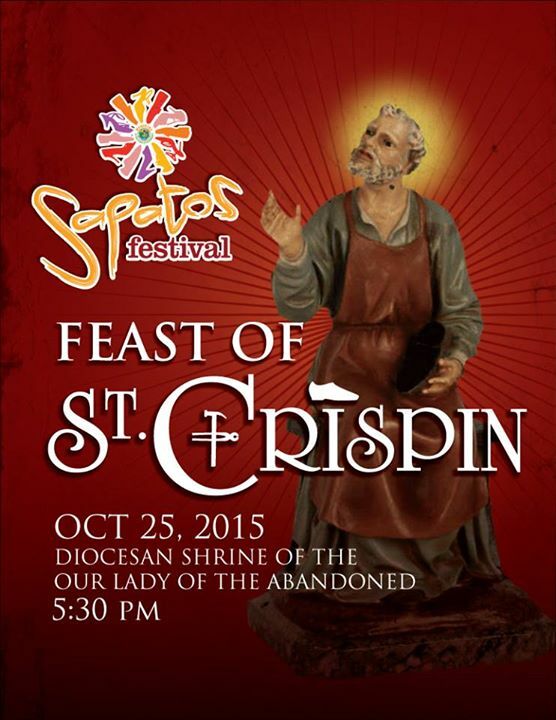 The feast of St. Crispin is observed every October 25 by Marikina being the patron saint for shoemakers and is the feast day of the Christian saints, and martyred twins Crispin and Crispinian. This feast is the first of the events included in the Marikina Sapatos Festival 2015 which will run from October 26 - December 30, 2015. One of the events was the "Our Lady of Marikina Replica Procession" which was held on the 2nd day celebration for 10th Canonical Coronation Anniversary of Our Lady of the Abandoned, Patroness of Marikina. 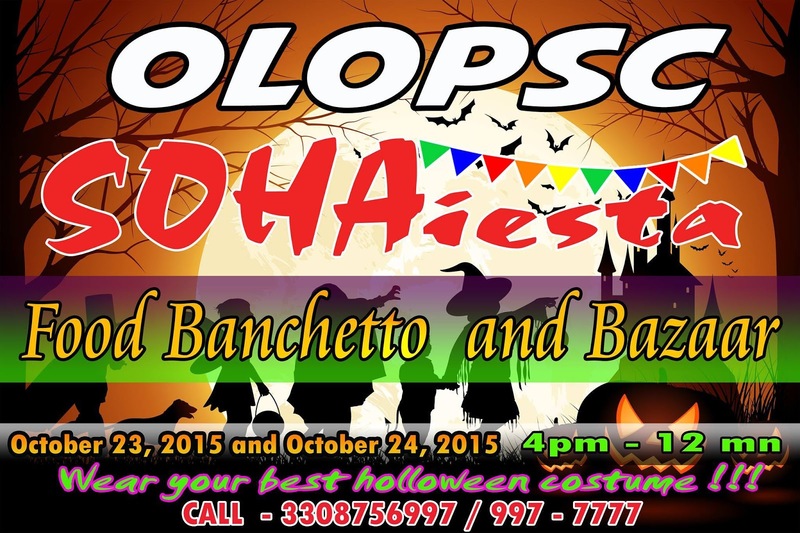 Everyone is invited to join the 1st ever Food Banchetto and Bazaar dubbed as SOHAiesta organized by OLOPSC Alumni Batch 1996 in cooperation with Society of OLOPSC High school Alumni ( SOHA ) at OLOPSC DC Arcadia Gen Ordonez St. on Oct. 23 and 24 at 5 pm onwards. Your favorite Marikina Restaurants like Crepeman, Mad Mustard, Kanzen Sushi and Cripy Doki will be joining the event. 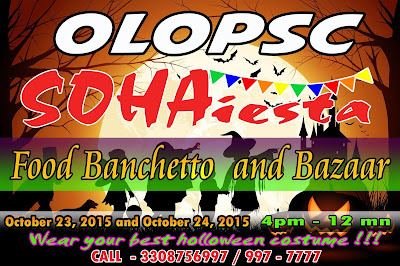 And not to be outdone, your kids get their share of fun... A Trick or Treat costume party from 5pm - 6pm. Also enjoy and listen to acoustic performers to liven up the night. Directions to OLOPSC DC Arcadia Gen Ordonez St., Marikina City. Despite rainy weather caused by Typhoon Lando, the 2015 Lilac Foodfest proved to be a successful one last October 17, 2015 with people dropping by to sample different cuisines and types of food offered. Similar to popular Food street destinations such as Maginhawa in Quezon City and Kapitolyo in Pasig City, Lilac Street in SSS Village, Marikina City is slowly becoming another food street with various non-food chain restaurants and cafes each worth visiting and checking out.